The rhizome of the perennial herbaceous plant Zingibor officinale Rosc. of family Zingiberaceae. Sichuan, Guangdong and Hubei provinces in China. Fragrant smell and pungent taste. Large, firm with heavy fragrance. Pungent, hot; spleen, stomach, kidney, heart and lung meridians entered. Warm the middle and dispel cold, restore yang and unblock meridians, warm lung and resolve retained fluid. It is one of the main herbs of warming middle energizer for its actions of warming the middle and dispersing cold, invigorating spleen and reinforcing yang and indicated for both excess and deficiency cold syndromes. For excess cold syndrome, it can be used singly or combined with other interior-warming herbs. For instance it is combined with Gao Liang Jiang in Er Jiang Wan from Tai Ping Hui Min He Ji Ju Fang. For vomiting due to stomach cold, it is usually combined with the herbs of checking adverse rise of qi and arresting vomiting. 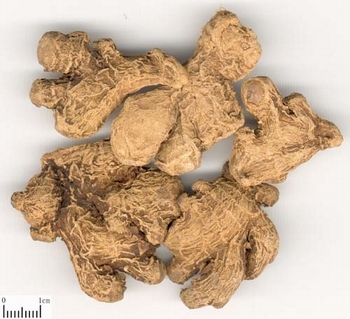 For instance, it is combined with Ban Xia in Gan Jiang Ban Xia Tang from Jin Kui Yao Lue; for cold pain in epigastric region, poor appetite, vomiting and diarrhea due to spleen-stomach deficiency cold, it is combined with the spleen-invigorating and qi-replenishing herbs. For instance it is combined with Ren Shen and Bai Zhu in Li Zhong Wan from Shang Han Lun. It has the actions of warming heart and invigorating yang, restoring yang and unblocking meridians. For yang exhaustion syndrome manifested as extremity coldness and indistinct pulse due to heart-kidney yang deficiency and interior cold excess, it is usually combined with Fu Zi for maximal effect to decrease the toxicity of Fu Zi as well as to strengthen the action of Fu Zi. For instance it is combined with Fu Zi and Zhi Gan Cao in Si Ni Tang from Shang Han Lun. It has the actions of warming lung to resolve retained fluid, warming spleen and regulating water metabolism. For cold-retained fluid accumulation in the lung manifested as cough and dyspnea, it is usually combined with Xi Xin and Wu Wei Zi, for instance they are used together in Ling Gan Wu Wei Jiang Xin Tang from Jin Kui Yao Lue. For external cold and internal fluid-accumulation syndrome manifested as chills with fever, without sweating, chest stuffiness, cough and dyspnea, clear and profuse sputum, it is usually combined with Xi Xin, Wu Wei Zi and Ma Huang. For instance they are used together in Xiao Qing Long Tang from Shang Han Lun. It is contraindicated for yin deficiency with internal heat, hemorrhage due to blood heat.